At Riverside Farm we love weddings. 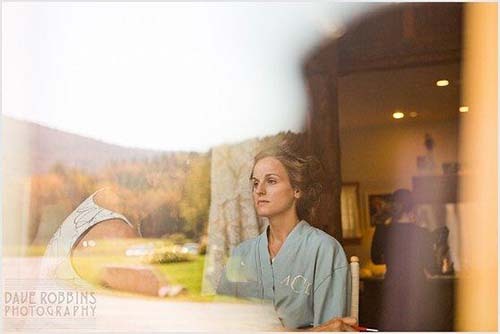 We love Vermont weddings. We love Barn Weddings. We love our exclusive destination weddings. AND we love the professionals we work with who elevate our weddings at Riverside Farm and Amee Farm Lodge to a higher level. This is the first in our occasional series of advice from some of the wedding experts we work with. The eyes have it. Eyes being our most expressive feature, on your wedding day you want them to shine. You want eye-color (not your makeup colors) to pop; basically you want definition and some intensity, to show your best you. You can get a subtle “smoky eye” with soft bronzes and browns mixed with deep charcoals. Consider lash extensions over false lashes (strip or singles); they are so much more natural AND you’ll have them on for your honeymoon. Eye makeup done properly will last 10+ hours. More is not necessarily more. 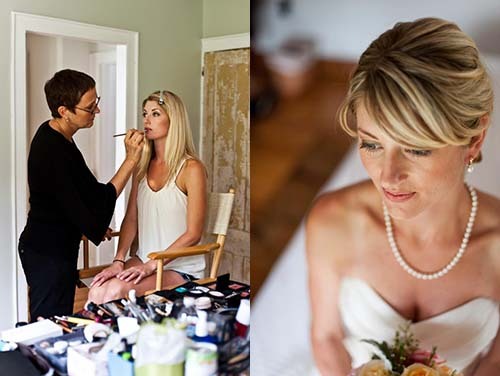 Some tipsters say you need more makeup than you think on your wedding day. (I am not in agreement.) To make sure you look radiant (your best self) in person, and are photograph-able from any angle (I’m talking makeup and hair here) for gorgeous shots, your makeup application needs to read so that you look in photos as you do in person! Your makeup should give you appropriate definition ( my favorite word! ), be appropriate to the dress you are wearing, the flowers, the overall ambiance and style of your event. It’s easier to add more makeup, than take too much away. Using Concealer. A concealer with a peach tone (peach offsets blue/purple) covers deep/dark under-eye circles. Concealer should have a perfect cream to powder balance; too creamy leaves creases, too dry looks cakey. And occasionally a concealer is best applied AFTER foundation. Lipstick longevity. Think about it, there’s bound to be some kissing and some champagne consumption, so you know you will want a touchup lip color. One trick is to pencil color, powder, place lip color or pencil over, and lightly gloss… Some companies, such as Nars, are making lip pencils to match their lipstick colors (Nars Dolce Vita is lovely). Lip pencils make touch ups a breeze. You can also keep it simple with a tinted gloss, which is easy to carry and apply without a mirror. Bring YOUR favorite products! You may have a foundation or mascara that you know works well for you. 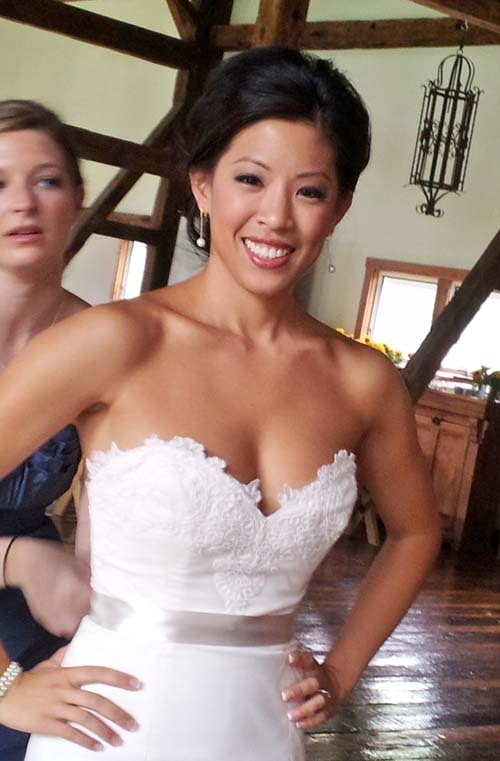 A professional makeup artist will gladly work with you so that you are satisfied with any and all product choices on the day of your wedding! A good makeup artist will and should bring a broad selection of brand and product!! Touch up is always key. You’ll need blotting papers or a finishing powder and your lip color (your Maid of Honor should be the keeper of the goods!) If you’re feeling extra cautious, throw in your waterproof mascara. My favorite finishing powder is Teint Poudre by Dr. Hauschka. A key ingredient is silk, a natural anti-bacterial. Finely milled, this finishing powder can be reapplied without buildup or looking powdery. Your wedding celebration may last 10 hours, your makeup should too, and you want to be perfect for all photos that will be taken! Look at wedding photos. Check out Pinterest posts for looks you like. Bring pictures and/or your iPad with Pinterest posts or your inspiration board, with for your preview; send photos and inspiration boards in advance to your stylists so you can be on the same page when interpreting a “look”. Who’s your photographer? 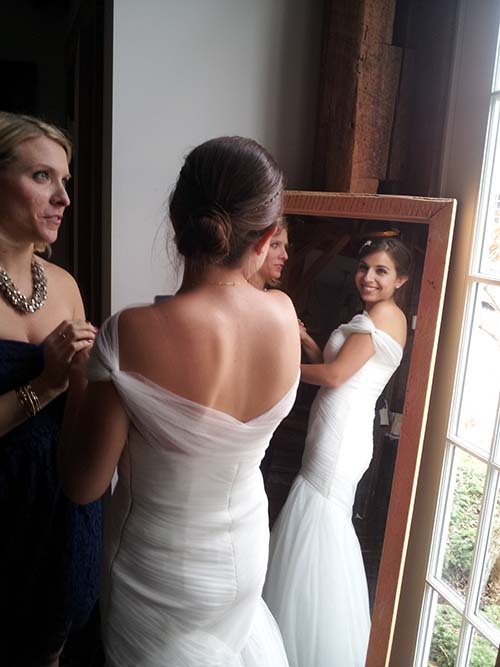 How does the photographer tell a wedding story, how do they “capture” the bride, her beauty, the guests and the day? Is there the same level of energy and presence from the first photos to the last? The photographer is telling your story and you are the protagonist in what really is the fashion photo shoot of your life: Your makeup matters. Your hair style matters. Your photographer matters. Get the best makeup artist and hair stylist you can. This aspect of your wedding should rise to the top of the list! 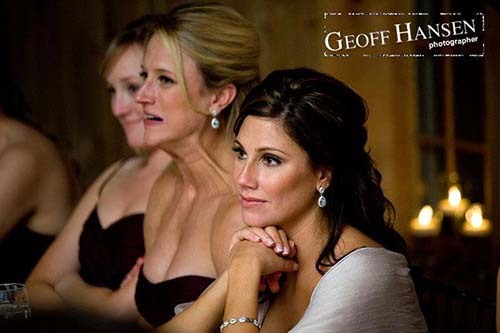 A great makeup artist and hair stylist will make sure you have the best products, will know the considerations for varying weather, resilience, lighting, time of day, and ambiance of your wedding along with having a good understanding of how your photographer works. 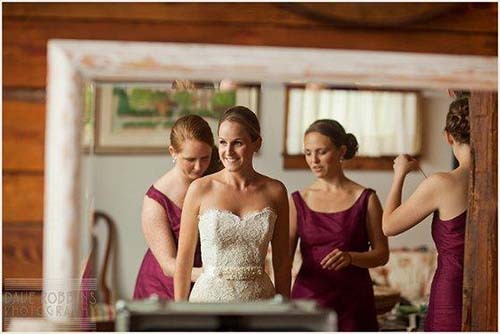 Your wedding vendors, including your makeup artist and hair stylist, actually make up a team that comes together with the goal and desire to provide you a seamless, beautiful experience. Contact us to find out more about a wedding at Riverside Farm or Amee Farm lodge.